The provider of the largest platform Microgaming has needless to say not been idle. They tend to release games with less fanfare than their up-and-coming rivals Netent, who often promote new releases with free spins via their casinos. So, we have seen several new MG 3-reel games to replace the AWP’s which were mysteriously pulled a few months back such as Hiphopapotamus and Treasure Ireland. These however are stocking-fillers for their download client. The big titles are their branded games Jurassic Park and Terminator 2 plus the innovative Today’s Weather. Needless to say the first two of these games are 243-way, the tried-and-trusted MG format which they seem to believe is the limit of player imagination. The Jurassic Park slot is based on the movie and features bonus rounds with large potential, but nevertheless can provide decent stacked-wild wins in the base game. As compared to say Thunderstruck 2 the base reel wins have lost a bit of value and more of the player return is held in the bonus rounds which can pay prolifically. Copy that last sentence to describe Terminator 2, only our dear old Austrian says ‘Hasta La Vista’ to multiple choice and instead inflicts a single bonus round upon the player. It consistently pays 10-50 x stake and is coloured ice-blue – except when Arnie fires up the ‘Hot Mode’ which will enhance the 1024-way bonus reels and typically pays 300-1000+ times your bet. Unfortunately, the player may wait until Christmas 2015 to see it. We have seen a recent new Microgaming game ‘Max Damage Alien Attack’ which is standard 243-way stuff but with random spacecraft strikes on symbols in the bonus spins round (JPG) but we have a refreshing change in the 20-line Today’s Weather, where there are 5 bonus choices each with different features including sticky wilds and expanders. The lucky player may see bonus rounds in excess of 1000x stake, as seems the math model in favour lately. A weather-themed slot? A new one on us…. That leaves the notable releasesÂ byÂ Net Entertainment or “Netent” as they tend to get dubbed. Now I’ll be the first to admit I am not a big Net Ent fan – hence why there aren’t any slots reviews of their games on this site – but they have in excess of 100 games and are among the most prolific online slots developers: they will soon exceed Playtech as the provider with the second-largest games portfolio and may well haveÂ Microgaming in their sights! To be fair, Netent do tend have innovative new ideas and boast the biggest range of different features from pretty much any provider bar WMS. Their games are always pleasing on the eye and usually interesting and there seems to be a release every month or so. This year their bigÂ releases were Top Banana, Attraction, South Park Reel Chaos, Wish Master and Lights. Top Banana is similar to the awful Wonky Wabbits – 100 poor spins interspersed with a multiple wild win to make up for it. Attraction is similar but uses a format of a shifting and sticky wild which activates either vertically or horizontally. As for ‘Lights’ you could try this in fun mode and I would hazard a guess that your one adjective to describe it would certainly rhyme with the singular version of the game title. Retrospectively,Â the big Netent guns of 2014 were Wish Master and Reel Chaos. Wish Master is unique in that you need one symbol to trigger the 10 enhanced spins and yes, you pay for each spin from your balance similar to Big Bang and its multiplier for consecutive wins. The big wins arise from the player hitting another bonus symbol when the first is still in play. Each time it lands it will add to the enhanced quantity of spins and you can have up to 3 enhancements in play at once. If you should get a wild reel, expanding wild symbol and extra wild symbol in play together you can achieve a full screen of wilds worth 500 x stake on one single spin – added to the other spins, pays in excess of 1000 x are easily achievable. 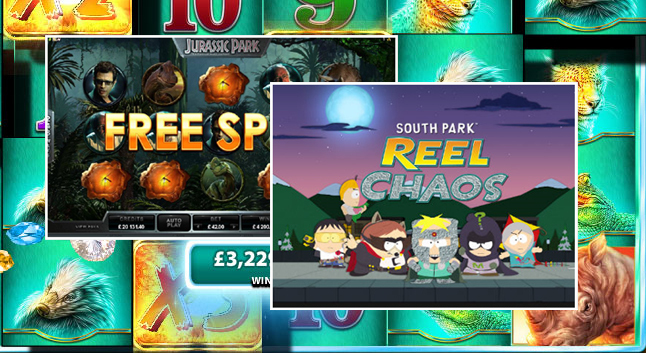 This leaves us with the zany South Park 2 (Reel Chaos) with multiple in-play features, random features and bonus rounds. Most definitely a ‘Marmite’ game. Has big-pay potential but mainly the multiple features mentioned means multiple disappointments. Despite the wide range of games mentioned here, we have one common factor as if the providers have collectively decided what algorithm us players prefer. Reduced standard reel wins often between a tenth and half your stake offset by an increased proportion of player return in the bonus features. Terminator 2 is a prime example where a 5-line win can pay just 1 x your stake. As for IGT, well, you could write theirÂ notable 2014 releases on the back of a fag packet. Most were simply clones of older games with the possible exception of Wild Wolf – but even that simply tookÂ their popular Wolf Run slot and just made the reels bigger! From a company that has developed some of my favourite ever games – the Cleopatra 2 slot being top of the list – I expected more. I would suggest we had more ‘turkeys’ than ‘crackers’ in 2014 thankfully, the crackers being Raging Rhino, Jurassic Park, Today’s Weather and Wish Master and the rest, well: roasted and stuffed! I’m sure others might have different opinions but hey, that’s me! Maybe when I am doing the 2015 slot review for Online Casinos & Slots you’ll find meÂ gushing aboutÂ Net Ent but for now, probably not. Are there any of you who solely play new releases without reverting to your old tried and tested favourites? I doubt it. Quantity of games available will never have more value to us than quality, but each year the catalogue of games and thus our choice increases which can never be a bad thing, surely? Merry Christmas to all you players out there!